The camp will now be held at Canterbury School in New Milford, CT. 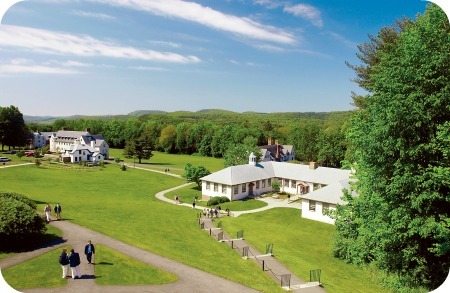 The new campus allows the camp to offer a wide array of health and fitness options along with its time-honored, top quality music instruction. It reminded me a bit of the idyllic campus in the old Patrick McGoohan TV series The Prisoner, minus the presence of that threatening giant balloon. “Charitable” doesn’t mean free, of course, but considering the high costs of summer camps these days, Litchfield’s charges seem reasonable, and a quarter of the camp’s students attend on needs-based scholarships totaling a value of about $100,000 each year. The camp’s website includes a video with information, and explanations from Braden, Jimmy Heath and others. YouTube has a collection of videos from previous camps. Here’s a 2012 student group getting familiar with the blues via Duke Ellington’s “Things Ain’t What They Used To Be,” including two choruses of collective improvisation. “I am NOT a number, I am a FREE MAN!”Patrick McGoohan (aka #6) in the best TV series of all time(IMHO). Let’s hope Litchfield Camp’s a more positive experience than his. By the looks of the faculty alone, it sure must be. Doug – I retired from the Canterbury School’s music department at the end of school year this past June. The camp has found an ideal new home, and I wish them all the best. I assume the name “Litchfield Jazz Camp” will be changed. Do you know what the new name will be?